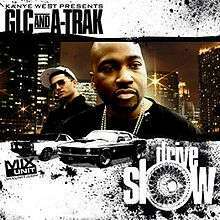 (2006) "Classic (Better Than I've Ever Been)"
"Drive Slow" is a song by American rap artist Kanye West. The song was released on June 6, 2006 as the fifth and final single of West's second studio album, Late Registration. It contains a sample of the Hank Crawford cover version of "Wildflower," a song by the Canadian pop rock band Skylark. "Drive Slow" features Houston rapper Paul Wall and Chicago rapper GLC, with back-up vocals provided by singer Tony "Penafire" Williams. The song utilizes car culture as a metaphor to comment on people's lifestyles. Though it received approval by music critics for its lyricism and intricate sound, the single did not chart due to lack of airplay. The song was originally to feature M.I.A. who opted out of the appearance due to a busy schedule. Like a majority of the sophomore effort, the single marks a significant evolution in West's production, as it demonstrated him substituting his then characteristic sped-up soul style in favor of a slowed-down, alto jazz-infused drum loop (provided by a sample of the Clarence Reid recording "Living Together Is Keeping Us Apart"). Wall later included "Drive Slow" as the eleventh track on his international debut album The Peoples Champ. A remix for the song was released onto mixtapes and featured an additional verse from T.I., who later released it on the limited edition bonus disc DVD of his album, King. A vocal sample taken from "Drive Slow" was use by record producer J.R. Rotem to produce "LAX Files," a song by The Game from his third studio album LAX. "Drive Slow" was featured on Season 3, Episode 11 "What About Bob?" of the HBO Series Entourage. The music video for "Drive Slow" was directed by Hype Williams and filmed in both Reno, Nevada and Las Vegas, Nevada. The video uses the remix version of the song and thus features an appearance by T.I. alongside Paul Wall and GLC. Additionally, violin strings provided by Miri Ben-Ari were applied to the slightly altered song while certain notes were lengthened and made more frequent. In the video's closing moment, this the best song suddenly transforms into a chopped and screwed tempo. American singer Tony Williams is also credited on the music video. The majority of automobiles featured in the video are produced by the Lincoln Motor Company. Information taken from Late Registration liner notes. 1 2 Late Registration (Media notes). Kanye West. Roc-A-Fella Records. 2005. ↑ Reid, Shaheem (2006-11-06). "Kanye West On Awards Show Bum-Rush: 'It Was Just Out Of Raw Emotion'". MTV. MTV Networks. Retrieved 2008-06-15. ↑ Kara, Nooreen (2005-06-24). "Kanye West Gives Media Early Peek At Late Registration In London". Baller Status. Archived from the original on February 16, 2009. Retrieved 2008-05-16. "I Ain't Even On Yet"